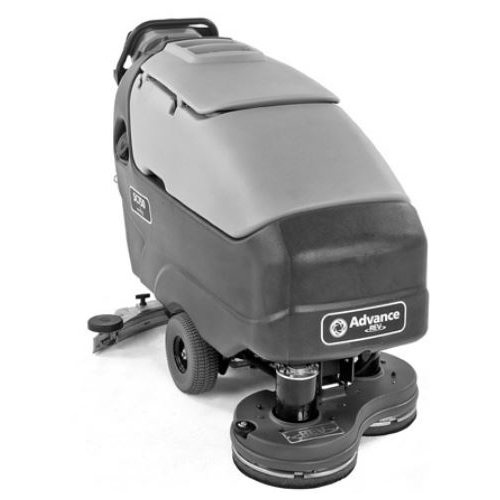 The SC750 Rev automatic floor scrubber from Advance is nothing like you'b ever seen in a large walk-behind scrubber. In a single pass, our exclusive Random Orbital Scrubbing Technology scrubs floors deeper and more uniformly, leaving your floors with a perfectly scrubbed surface with no swirl marks. With the SC750 you will see amazing results immediately during operation. The REV scrubbing technology includes distinct orbital and rotational motions: high speed quarter inch micro scrubbing and fourteen inch rotational low speed macro scrubbing. This powerful, patented scrubbing combination delivers a uniform, non-swirled floor surface while using far less water and chemicals then traditional methods. In addition at being a superior daily scrubber, the SC750 REV is so efficient at deep scrubbing; you can remove floor finish in a single pass, with no chemicals. Floors are left ready for restoration without the use of harsh chemicals, slippery floors and additional labor costs. Better results, Increased productivity and Sustainable cleaning. The SC750 REV with Random Orbital Scrubbing Technology provides these important benefits for facility floor maintenance. The SC750 REV combines the innovative REV technology with enhanced cleaning performance. With a 40 percent wider scrub path and 20 percent faster scrubbing capabilities than 20 inch floor scrubbers, the SC750 REV increases operator productivity, allowing for more floor area to be cleaned or deep scrubbed in less time with better cleaning results. REV deep scrubs floors without the swirls, leaving behind a clean, dry, completely uniform and prepared surface, ready for finish coating. Patented REV random orbital scrubbing technology with high speed quarter inch micro scrubbing an rotational macro scrubbing, attacks dirt from multiple directions for superior cleaning effectiveness.